I was the largest publisher in the country of artwork from television commercials, creating the first ever animation art lines for Coca-Cola, Anheuser-Busch, M&M/Mars, Pillsbury, etc.. The rubber duck, like jazz, and even animation, is actually an American art form that originated here. Thus CelebriDucks was born as a side business where we created the first ever line of celebrity rubber ducks of the greatest icons of film, music, history and athletics. We felt we could take the level of detail in the sculpting and painting of the rubber duck to a whole new level and elevate the art form altogether. We were even voted one of the top 100 Gifts by Entertainment Weekly and thus I sold off the animation business to concentrate completely on rubber ducks! Although the rubber duck was invented in America, over the years with all the outsourcing of our manufacturing, it got to the point where not one rubber duck was even made here anymore. We were already the only U.S. company still doing our artwork and sculpting here. But I wanted more than that. I wanted to bring the whole industry back. And then something very unique happened. We got a call from the Seiberling Estate. Seiberling was one of the original rubber companies in America and they went on to create Goodyear Tire. They also were the ones who created one of the first ever rubber ducks! They are in Ohio where they offer tours of their beautiful estate. Back in the early 1930s, with the release of Disney’s Snow White, Seiberling’s director of marketing approached Walt Disney about becoming one of their first licensees and creating a line of rubber Disney characters including the first rubber Donald Duck. They were tremendously successful. When we started speaking to Seiberling, we all agreed that it would be an extraordinary story to actually create a rubber duck for them right back in Ohio where it all began. Our art department was already in Cincinnati. Our first factory was also in Ohio at the time. So why not start to bring the whole industry back here. 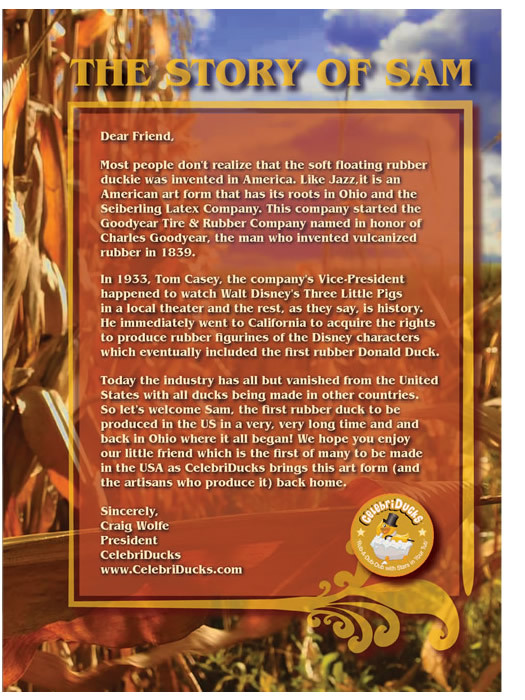 Seiberling was very excited and the joy of seeing it all come full circle not only to Ohio, but also to the actual place where it all began and create our first made-in-America rubber duck for Seiberling and also for hundreds of other companies has become a reality. And so we are currently in the process of making rubber ducks here. It has been much more creative with costs and governmental laws, but we are doing it. Bottom line, I am so happy and proud to be able to bring this industry back here. May it be the first of many!